Yes! Send me the list. We know you're busy mama and we want to help you prepare for your next trip. 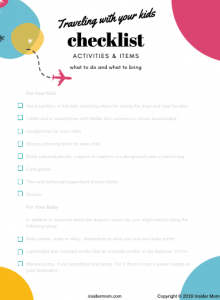 The Traveling With Kids Checklist will help you prepare for your next vacation with your little ones. Avoid stressing and forgeting what to bring. Sign up below to get it! * We dislike spam and won't give your email to third parties. By signing up you'll get our newsletter, one we only send out once a week that offers helpful information and tips to make your day a bit better. We'll also occasionally send information about upcoming events and opprotunites we think you'll like. We hope you'll love being an Insider Mom, but if you don't you can unsubscribe anytime.